2002 model powered by twin Volvo V6 GI 225 hp Duo-Props, kept in dry storage on it's Ezi-Loader tri-axle trailer. 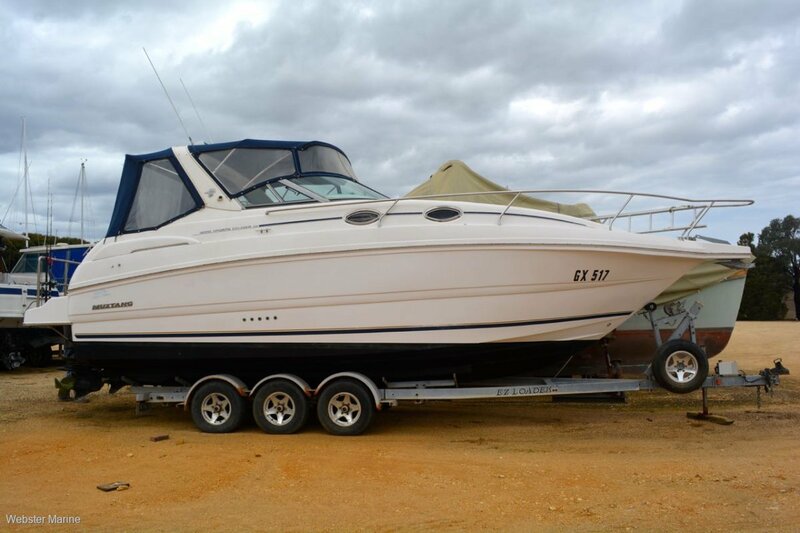 Very good condition throughout with clean bilges and good inventory which includes Lowrance plotter/sounder, TV/DVD, 40 amp built-in charger, 240v shore-power, Stat Power inverter, hooded stainless BBQ, Muir electric windlass, remote spotlight, VHF radio, teak laid swim platform with shower and full camping covers. Accom features 2 x double berths, galley with electric fridge and dual-fuel stove, bathroom with electric flush toilet and hot shower, plenty of seating in the cockpit. Servicing was done in January 2019 and manifolds/risers were replaced 2014. Priced to sell.